Here’s a final etegami for National Library Week* 2013. 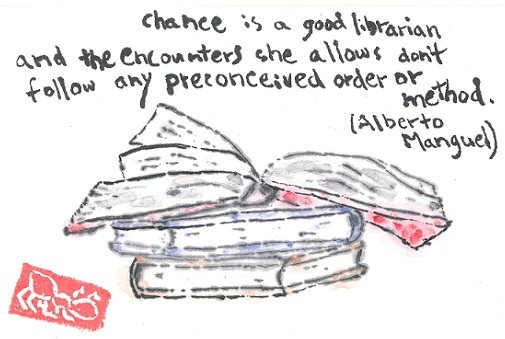 The words are from Alberto Manguel, author of The Library at Night: “Chance is a good librarian and the encounters she allows don’t follow any preconceived order or method” (source). As a librarian, I know that my profession does not often leave things to chance — we organize and sort and cull as necessary, we create guides to our resources (books, journals and magazines, data, archives). We can go to our order records and tell you when something was received in our libraries and how the item got paid for. We can see through our circulation records which items are popular, which are collecting dust. Our regular shelf readings help us keep books in their right places. But we also provide places for readers and researchers and the-just-plain-curious to wander and see what’s there. Chance can take its course and lead people to what they might not always find, and what our user guides and catalogs might not necessarily bring to the fore. Chance is the invisible staff member at all libraries. *oh, wait, I haven’t tried this quotation yet: In literature as in love, we are astonished at what is chosen by others, by Andre Maurois! I’ll save it for later.